If there’s one baby essential that can make or break your day, it’s baby wipes. They can be the difference between fuss-free nappy changes and easily sorted spills, or a hot mess. We let a bunch of Babyology mums test out Red Nose Baby Wipes, giving them free reign to tackle any mess their kids could conjure up. Baby wipes are the ultimate weapon in any mess-fighting duties when you have kids. Of course, they’re intended to clean up messy faces and bottoms, but any mum will tell you they’re invaluable in any messy situations around the home. Mums will also tell you that all wipes are not created equal. So we gave a group of Babyology mums Red Nose Baby Wipes, to see just how they hold up against every day mess and mayhem. From the outset, it has to be said that one of the most endearing features about Red Nose Baby Wipes doesn’t actually have anything to do with cleaning. And the fact wasn’t lost on our mums, who loved that every sale results in much-needed funds being donated to Sudden Infant Death Syndrome research. There’s precious little more frustrating than trying to change a wriggly baby, and not being able to get just one wipe out with your one spare hand. Our Babyology mums gave a big thumbs up for the ease with which they could pull a single wipe from the packet, and they were also really happy with the moisture content, and the great job they did cleaning each mess. 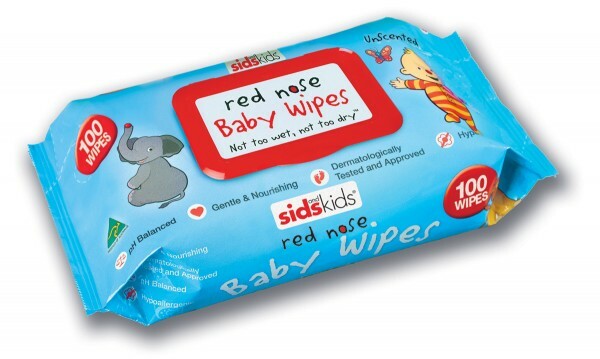 The mums agreed that Red Nose Baby Wipes were strong enough to handle any mess, but still soft on baby’s skin, and all of the mums gave the quality of the wipes a rating of four or five stars out of five. The overwhelming majority (94 per cent) of the mums in the trial said they would use Red Nose Baby Wipes again, and they would also tell their friends to buy them. And perhaps one of the most telling results from the trial is that more than 70 per cent of the mums said they preferred Red Nose Baby Wipes to their current brand. A strong wipe that worked well. I’m half way through the package and am happy with them. I like how the wipes’ brand supports SIDS. There are a few things I like about the wipes. The best feature is that they only come out of the pack one at a time. I also like the larger pack size and the press click lid. I liked that they were soft. Similar to another brand we’ve used before. It’s great that they support SIDS so would happily buy them in the future. Consistent moisture throughout the pack – doesn’t dry out too quickly and not really wet toward the bottom of the pack. They are nice and thick so I don’t have to worry about tearing while wiping messy bums! Also gentle enough to use on hands and faces. Comes out one sheet at a time, always moist, feels soft to the skin. Do the job. Even on number three! They don’t seem to be as cold as other wipes. My six-week-old usually hates it when I use wipes on her, but these she doesn’t mind. They were great and just got the job done. Would be happy to use this brand again! They had no perfumed smell and they came out one at a time. Such a pain when you’re trying to clean up and two wipes come out causing waste. Red Nose Baby Wipes can be purchased directly from Aussie Wipes, or from several retailers including Big W, IGA and Chemist Warehouse.